Here's a 2-tiled version of the Cornerstone Victoriana Velvet Drapes that will match any bedding you have in your game (either Maxis or custom). (The 1-tile version can be downloaded here. ) The fabric part of the curtain borrows its texture from any bedding you have in your downloads folder (if it's a recolor on the Colonial Ironwood bed), while the metal/tassel parts of the curtain can be recolored separately (to recolor the fabric, you have to make a recolor of the Colonial Ironwood Bed bedding). The curtain also works on diagonal walls. There is also a silver recolor of the metal/ tassel parts of the curtain that can be downloaded separately. Compatibility: Does not require any expansion packs and should work with all versions of the game. 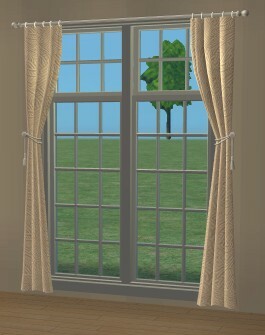 The window used in the screenshots is from the Le Petit Trianon Collection by simnuts101. 1875 people have said thanks to IgnorantBliss for this download.